Every great conductor started out as an accomplished instrumentalist. Look at the biography of Sir Neville Marriner, who passed away yesterday at the age of 92, and you’ll be reminded of this truism. In the 1950s, Marriner performed as a violinist in two celebrated orchestras: the Philharmonia and the London Symphony. 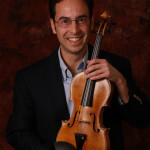 For 13 years, he served as second violinist of the Martin String Quartet. He first picked up a baton around age 40. He rose to prominence as an internationally acclaimed conductor and remained active until the end, conducting his final concert last Thursday. Sir Neville Marriner will be remembered as the founder and longtime artistic leader of the Academy of St. Martin in the Fields. The London-based chamber orchestra (one of the world’s most recorded ensembles) began in 1959 as an informal gathering of top-tier London musicians who rehearsed in Marriner’s living room. The ensemble won a Grammy Award in 1984 for the soundtrack of the movie, Amadeus. In 1969, Marriner founded the Los Angeles Chamber Orchestra. Marriner offered vibrant, modern performances of Baroque and Classical music. Additionally, he was a champion of English music. His repertoire was surprisingly wide-ranging, including celebrated recordings of Samuel Barber’s Adagio for Strings and George Gershwin’s Rhapsody in Blue. Here is a brief sampling of Sir Neville Marriner’s extensive discography. Please share your own favorite Marriner recordings in the thread below.